A legitimately spooky crack on an Antarctic ice sheet that was first discovered last Halloween is prompting a scientific research station to cancel its 2018 winter field season. Citing the “power and unpredictability of nature,” British Antarctic Survey director Dame Jane Francis announced today that the Halley VI Research Station will be closed from March to November 2018 to ensure the safety of its scientists. 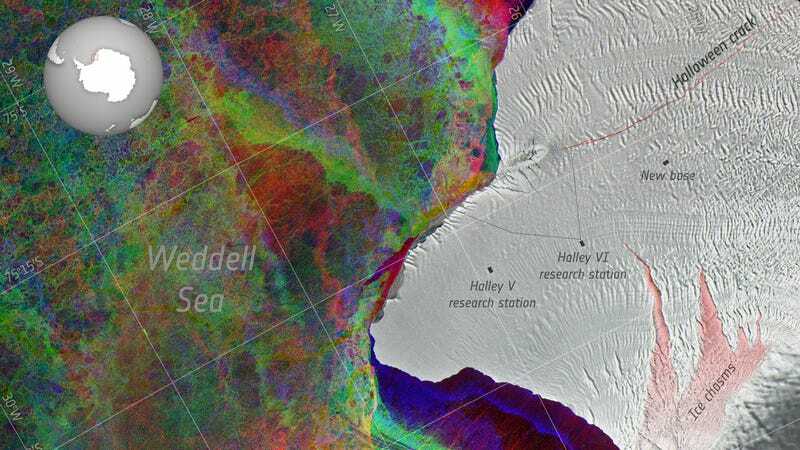 The BAS is concerned about the so-called Halloween crack, which has been migrating eastward across the Brunt Ice Shelf ever since it was discovered on October 31, 2016. The crack, which was approximately 31 miles (50 km) long as of last week, lies just north of Halley VI and could threaten the stability of the 150-meter thick ice shelf on which it sits. Halley VI’s icy turf is also threatened by a chasm to the south, which, after 35 years of dormancy, has been accelerating northward for the past seven months. Should either crack or chasm cause part of the ice shelf to snap off into the sea, the BAS would prefer nobody be around to witness it. It’s the second year in a row that wintertime research at Halley VI has been canceled out of an abundance of caution. Last December, scientists were also forced to tow the modular research station 14 miles inland to ensure it wouldn’t be on the “wrong side of the crack” should a major calving event occur. Halley VI is the latest in a long line of British-run research stations that have studied Earth’s atmosphere and space weather from atop East Antarctica’s Brunt Ice Shelf. Earlier iterations of the station led to the discovery of the Antarctic ozone hole in 1985, whose recovery Halley scientists are currently tracking. Halley researchers also participate in European Space Agency-led studies to understand how humans will adapt to the long bouts of darkness and isolation characteristic of both Antarctica and outer space. According to the British Antarctic Survey, recent changes to the Brunt Ice Shelf are driven by the natural process of ice flowing out to sea. Eventually, a buildup of stress causes ice shelfs to break off into icebergs. In other parts of Antarctica, accelerated ice shelf breakup is being driven by rising temperatures. Natural calving events allow scientists to study how this frozen continent, whose shelves hold back many feet of potential sea level rise, will change as we continue to warm the planet. Athena Dinar, a spokesperson for the BAS, told Earther that scientists are starting to head down for the summer 2017-2018 field season. She added that any iceberg calving event “is unlikely to happen quickly,” and that the BAS is monitoring the situation on the Brunt Ice Shelf closely with radar and satellites. This article has been updated to include comments from the British Antarctic Survey.